Clifford Odets isn't at all surprised that his star actress and extramarital consort Frances Farmer is being called back from Broadway to fulfill her contract at Paramount. "Sure, they know you've got something," he says. "But they don't know what it is," she insists from the bed. "Do you?" he asks. Do I? Frances is one of the toughest movies to write about in this whole series, because it's been an abiding favorite forever and I have a hard time decoding why, much less articulating it. I don't even remember when I first saw it, or how many times I'd been through it when I wrote this unimpressive review, which lavishes praise on Jessica Lange but has trouble finding anything else in the film worthy of compliment. The movie is a patchy experience on its own terms, probably too long, perfunctory with most of its second- and third-tier characterizations, and erratically committed to the voiceover narration of Sam Shepard's Harry York, himself a blatant and opaque construct of the screenwriters. The various asylum sequences are such egregious reprises of Snake PitSuddenly, Last Summer booby-hatch clichés that the facilities where Frances was filmed demanded an exculpatory credit at the end. Rudimentary research into Frances's life reveals that, for all her well-documented tribulations, she likely didn't have the lobotomy that dominates the last twenty minutesan almost certain myth that the movie helped to consecrate as fact. Even László Kovács's handsomely gloomy lensing, a major asset in giving Frances some tonal coherence when its story skips or stumbles, gets punctured at odd moments, like a hitchhiking scene at a dusty, inexplicable crossroads that is so garish and awkwardly shadowed that it looks like a process shot. There'd be no rationalizing these demerits in any objective critique of Frances, but in my ongoing emotional response to the movie they are immaterial, or even constructive despite themselves. In the story of a headstrong, ambitious actress fighting so many battles and losing, it's arresting to watch Lange duke it out with a movie that's often fraying all around her and still come out on top. Much of the press about Frances focused on Lange's remarkable about-face from her inauspicious early years in Hollywood, and it's always exciting when previously negligible performers suddenly prove their mettle. Maybe Lange's triumph feels categorically different to me than Charlize Theron's or Hilary Swank's or Ally Sheedy's because I saw hers first, or because she more single-handedly rescues a more faltering vehicle than Monster, Boys Don't Cry, or High Art. A closer comparison might be what Marion Cotillard pulls off in La Vie en rose, a movie I admired quite a bit but have avoided revisiting, and which struggles, as Frances does, with narrative architecture, basic transitions, and histrionic relationships to fact. Cotillard has proved as consistently ingenious as Lange did, which further cements the comparison. But Édith Piaf was a momentous figure by any measure, demanding virtuosity from her interpreters. Part of Frances Farmer's tragedy is that we barely know how good she really was, given her wobbly body of film work, the varying reviews of her theater outings, and the chauvinist, industrial, familial, medical, and penal apparatuses that denied her talent any fuller hearing. Lange achieves galvanizing solidarity with someone she likely outclassed in their shared vocation, without playing up or down to her, and with little evident vanity. She works through most of the ugly affects you can conjure on a screenfury, despondency, aggression, self-righteousness, recklessness, booziness, helplessness, hollownessand still makes it clear that Frances deserves our respect. She reaches precipices of feeling that Lars von Trier's or Mike Leigh's or Michael Haneke's characters sometimes reach, but she gets there without a von Trier, Leigh, or Haneke to guide or protect her. The closest creative ally she's got is Kim Stanley, an actress as hard-charging as she is, but their job on camera is to extinguish each other, and even on her kindest day, Kim Stanley is no earth mother. If there is anything precious or Oscar bid-y about Frances, and there isn't much, it's snuffed by the impression of a new artist, prodigious but still green, taking an astonishing risk. The loneliness is tangible. Immolation seems like a real possibility. When Clifford demands that Frances stop "acting desperate" on stage, fulminating that "I want you to be desperate," we hear his counsel as punitive and dangerous. Lange must know that, too, but in pursuit of a tough but fragile character's truth, she takes the enemy's advice. One area where Frances deserves credit is its refusal to couch the narrative as the silencing of a great artist. The script includes no scene where Frances performs. Instead, like Lange, it seems hooked into a notion of Frances as a woman of squelched ideas, a thinker for whom Hollywood might already have been a step in the wrong direction, even in that brief interlude when the going was good. The moving, economical opening privileges a prize-winning speech Frances gave at 16 years old about crises of faith and the death of God. The editing gives this articulate meditation at least three guises: something Frances thinks, something Frances wants her mother to hear, and a vehicle by which Frances provokes her community. But it's also a fourth and rare thing: immediate evidence of a woman's intelligence, treated sympathetically in a Hollywood film that isn't "about" intelligence, per se. Movies about non-ridiculous smart people, almost always men, tend to be filled with digital swirls of numerals and fractals that only they can see, on their way toward some momentous but embattled contribution to the human brain trust. Neither A Beautiful Mind nor The Imitation Game nor The Theory of Everything, to take three recent examples, really expects the audience to grasp what these men know, or how they think. Frances relates differently to intelligence, conjuring Frances's complex thoughts on a difficult subject as a virtual overture, anticipating that we will not only follow them but empathize with her through her pensiveness. This is all the more extraordinary given how few female voiceovers you or I can recall in Hollywood movies that are not bluntly expository, man-focused, lightly comic, and/or redundant to the images. Lange never turns Frances's braininess into a mannerism or an eccentricity. Her smarts are an embedded presumption of the screenplay and performance, as Frances taunts judges and cops with witty repartee, or fights a smirk at the dim puns and weak analogies offered by studio chiefs and psychiatrists. The climactic lobotomy may not be based in truth, but it's more than just a broad indicator of Rock Bottom. Frances has constructed its heroine as an intellect with too few outlets and supports, further plagued by erratic judgment when she finds them. Artist biographies often treat muted creativity as a cardinal injustice, but Frances and its team seem more aggrieved that this feisty, skeptical, ambitious but misdirected thinker can no longer think. So forget, just for a second, the question of how Frances Farmer wound up in mental asylums, over and over. What was she doing in the movies? How does a high school student with questions about God and curiosity about Communist Russia wind up posing for photos before a wall of fake flowers, or "acting" "scenes" where she pratfalls repeatedly in the mud? Frances deserves some blame for not telling us. Possibly for reasons of frugality, we don't accompany Frances on her life-changing trip to Moscow. We also don't hear much of the intellectual and political foment in and around Harold Clurman's Group Theatre. A stronger movie might have shed more light. But Frances, wittingly or not, despite its harrowing portrait of studio machination and motherly fame-whoring, also evokes the mysterious pull of Hollywood in unique ways. What, after all, is Lange doing in movies? There is so much rage in her performance, such palpable contempt for the industry's stupidityand this in her big coming-out performance as a Hollywood star. She barely asks the viewer to admire her acting, or acting in general. Whereas Meryl Streep's meticulous craft in Sophie's Choice is almost a relief, giving you something to marvel at when the horror of the story is too much, Lange affords no such margin for critical appreciation. For all the tremendous empathy Frances conjures (and John Barry's unexpectedly harmonica-heavy score deserves some credit here, too), you spend most of the film scared of Lange and scared for her, too. Without the quick follow-up of Tootsie, you wonder if she'd have run into the problems that Stanley herself did, or Emily Watson did: being brilliant in ways that limit people's casting ideas or make them nervous to collaborate with you. In the thirty years since Frances, Lange has been admirably unbashful about the shortcomings of the industry and frequently critical of her own films. Sometimes you feel her contempt within the film. When she's bored or trapped, she retreats into perma-scowl and default affectations. There are few film actors in my lifetime who have excited me more than Lange, and few who have made me wonder more often if this work really makes them happy. But maybe she has no choice. The best explanation I can find for these riddles is the formidable mixture of conscious will and demonic possession that Lange taps into as Frances, and which Frances expresses more fully than any of her other films. Just as the character won't give up on her mother, even as Harry begs her to, Lange won't give up on Frances, even as it asks too much of her, or furnishes too little, or asks the wrong things. She hasn't given up on movies, either, as infuriating and frivolous as they can feel, and as many times as she's pledged to quit. None of this precisely explains why I love Frances so much, or why it shook me so as a college student (I think? ), or why I've screened it so many times since, or why I forced my partner to watch it once for my birthday, or why I'm doting over it on my homepage. I'd give anything for more movies to value their characters' intelligence, especially women's intelligence, or to register how will and intellect tend to freak people out. I don't exclude myself. Frances's particular smarts always intimidated me. At least in the movie's version of events, she asked tougher questions at 16 than I ever did, she traveled further and took bigger gambles, and she refused to rescue herself from looming disaster, even as it became clear that nobody else would help. Maybe she was so inquisitive that even catastrophe made her curious, rather than sparking any self-protective urge. Frances is The Piano if Ada stuck her foot in the rope every 15 minutes, and nobody jumped after her. The grimness and sharp edges of so many of my favorite films reveal that I have some of that curiosity, too, but for better or worse, I'm much less fearless than Frances, and less fearless than Jessica Lange. Watching her commit so fully to this performance, inviting glory as well as injury, emphasizing that aspect of Frances that bit every hand that fed her, reminded me of people I knew in school who were smarter than I was and thought bigger thoughts but bridled at rules and questioned The Game, often to their detriment, even if they didn't see it that way. Their spirit and savvy manifested in ways that galvanized me in my obedience, for which reason I couldn't or wouldn't duplicate or grasp their example. I have always channeled my incorrigible love of movies into intellectual endeavor, pedagogical role-modeling, and pleasure in other people's art. Lange seems as smart as they come, as moved by art and as skilled at making it as anyone, but there's an itch beyond intellect or artistry, maybe even beyond empathy, that she seems to scratch with acting. To do it, she uses emotions I've luckily been spared for most of my life, and often too scared to touchespecially anger and despair. She advocates too strongly for Frances Farmer to be accused of merely using her in the pejorative sense, but she does use her, to express something enduring and insatiable that both astounds and escapes me. 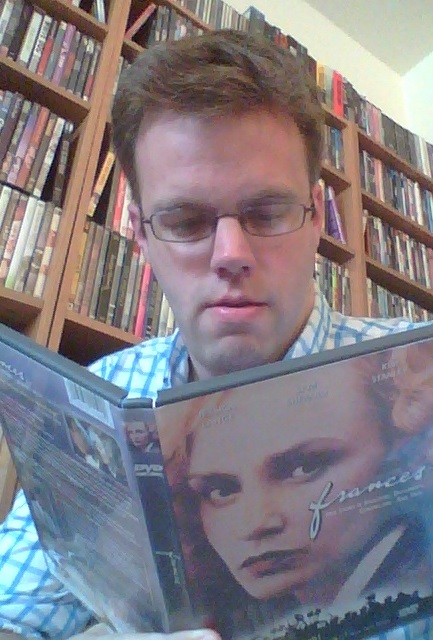 I understand it a little better every time I watch Frances, but it never loses its mystery. It's something private between Jessica and Frances, or between Jessica and the world. In that sense, the weird fitfulness of the movie actually helps, concealing or distorting much of what it purports to disclose. I'm still perturbed at how hard it's been to spell out these thoughts, and how unconfident I am of having done so, but I suppose that's the point. Frances is about a person I like to imagine I'd have embraced and understood, but whom I might not have. She is brought to life by an artist I idolize but whom I also might not understand, who has been to the third rail and back. I don't envy her, but she seems able to handle this unnerving gift, and I at least relate to whatever keeps her returning. I can't stop coming back to movies, either, even to some that fall visibly short of apparent aspirations. I like feeling unequal to people and things I admire, and perplexed by what excites me. As broken and compromised a text as Frances is, it's always inspired sublime feelingsnot the serene sublime of the well-wrought urn but the mystifying and overpowering one of the Prelude, all thwarting winds and raving streams, but majestic nonetheless. Hey, Reader: What's the performance or who is the actor you idolize in ways that surprise even yourself?